Seed cycling has been touted as a tool to help women regulate and improve the symptoms of their periods. Seed cycling involves taking a combination of flax and pumpkin seeds (1-2 tablespoons each) during the first half of the cycle (from when period starts until ovulation, the “follicular phase”). Then take sesame and sunflower seeds during the second half (after ovulation until the period starts again, the “luteal phase”). In the case that one does’t have a period, one can sync this cycle up with the cycle of the moon. At which point, one would take the flax/pumpkin seeds from new moon to full moon, and the sesame/sunflower combo from full moon to new moon. 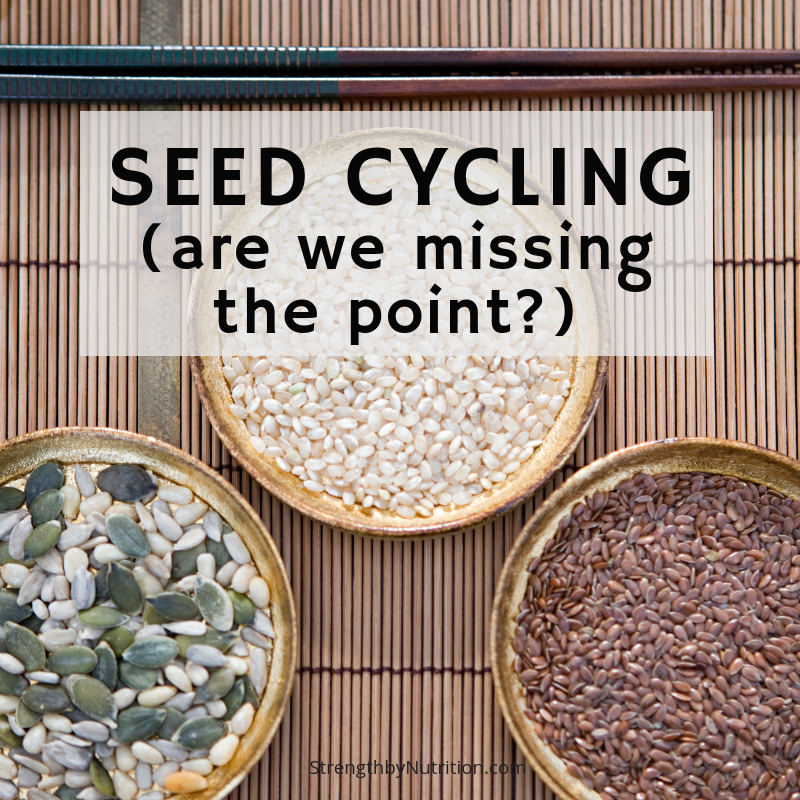 I shared an Instagram story about mixing a bowl of all 4 seeds and eating a few tablespoons of it throughout the day every day, rather than worrying about cycling specific seeds throughout specific phases of your cycle. I received a surprising amount of questions of whether it was still beneficial, which made me wonder: What kind of scientific evidence is out there supporting the claims of seed cycling? One theory for changing seeds at different times of the month is that the varied nutrients will theoretically support the follicular and luteal phases differently. There is also evidence of different use and mobilization of nutrients during different phases of the cycle (like an increase in calcium in the blood during follicular phase and increase in magnesium during the luteal phase), but I’m not convinced that warrants supplementation. In terms of which source of information I hold superior, research or anecdotal evidence, I lie somewhere in the middle. Meaning, sure I’d like to see a few hundred studies and a meta-analysis review on a specific topic, but I also value the individual experiences of the large population of women I work with on a daily basis. As for seed cycling, there are minimal studies conducted on the effect of seed cycling on the regularity of menstrual cycles. However, there are many women who have had great success with it. Which led me to my next question: Perhaps it’s not the CYCLING of the seeds that proves the benefit, but rather the INGESTION of the seeds at all. One thing I’ve noticed while looking at the food diaries of some women, is that the focus on whole foods is still lacking. And nuts and seeds are no exception. Rarely ever do I see the incorporation of whole nuts and seeds into a women’s diet unless it’s in the form of PB2 in a smoothie or a few nuts in a protein bar. Perhaps the actual incorporation of seeds into the diet is what is providing the health benefit for women’s nutrient needs and regulating hormones. But if you look at the studies compiled in Pubmed and Google Scholar, you don’t find any published studies comparing seed cycling with any kind of control. Nor will you find one that looks for alterations in hormone levels when using varying seeds compared to a control. There has been, however, some evidence on flaxseed showing an improvement in reduction of the perception of stress, improvement in ovulation, and increasing length of luteal phases in women. Here is a really informative post about how daily use of flaxseed can improve your periods, if you’d like a comprehensive review. Among many other reasons, including this one, I recommend both women AND men sprinkle 10g/day of freshly ground flaxseed on their meals throughout the day. There is no solid scientific evidence that supports switching between seed types between the phases of your cycle or moon. Is it going to hurt anything? Probably not. And I know that there is a LARGE amount of anecdotal evidence that swear by the power of seed cycling to ‘regulate’ their period symptoms. But a part of me wonders if the benefits of improving the regularity of periods (and hormones) would be accomplished just as much by ingesting all four types of seed throughout the entirety of the cycle. Perhaps all that is necessary is increasing the amount of healthy fats through a combination of nuts and seeds (and other whole foods) throughout the entirety of the cycle. Wanting to put this to this information to action? Consider 10g of freshly ground flaxseed per day as a reasonable step in improving overall health and hormonal benefits.